Romany Garnett, the John Muir Trust’s Conservation Officer for Quinag, pays homage to the golden eagle – the creature that perhaps more than any other symbolises Scotland’s wildest, most rugged landscapes. Silhouetted against the sky as it soars above a mountain peak, wing tips splayed, the golden eagle is an awe-inspiring sight. Majestic in slow motion, the two-metre wingspan gives the flight a steadiness and power that is matchless. Its hunting prowess has been honed over centuries, driven by instinctive wisdom. Everything about this bird is impressive. Sharp eyes that are focused and intense. A beak with a yellow base that hooks round to a grey-black tip. The velocity at which it hurtles through the sky when hunting. The powerful clutch of the talons. A wildness whose depth is hard to fathom. Their sharp eyes, eight times more precise than a human’s, can pinpoint a flicker in the grass from great distances. They tilt back their wings and can reach over 100mph as they take the fearsome plunge towards their target. Their diet varies between areas and seasons. When food is scarce they rely on carrion. In the spring and summer, live prey is more common and can include field mice, pigeons, ptarmigans, fox cubs, mountain hares and deer calves. Their territories, whose range can vary from 50 to 150 sq km, are defended fiercely – especially during the breeding season – by a pair of eagles. Their area often overlaps with others and at certain times of year they can tolerate shared hunting ground. “It seemed to me that their territories had more to do with wind direction than physical boundaries,” says Jim Crumley. The tracking programme, Roy believes, helped influence policy and legislation, including the Wildlife and Natural Environment (Scotland) Act 2011, which introduced ‘vicarious liability’, making landowners responsible for illegal persecution carried out by gamekeepers. “There is definitely less persecution now from small-scale land managers; this is quite noticeable,” says Roy – although he believes that on some grouse moors the problem is as serious as ever, aggravated by the use of specialised equipment and rifles with night sights. Satellite tracking is also helping protect eagles by getting the public more involved. People have been able to follow individual birds via a map-based website, so there is a growing public interest in the golden eagle and the threats it faces. So when are the best times to see the golden eagle in its full glory? Because they rarely eat where they kill, preferring instead to carry their prey to a favourite place, they are elusive. Their eyries – which can be a massive confusion of sticks and heather as yearly repairs are piled on top of the old ones – are usually balanced near the edges of inaccessible cliffs and crags. They spend most of their time perching, and their deep brown plumage and paler golden feathers around the back of the neck help them blend into the landscape. Early spring is the best time to watch their spectacular courting displays. The fullness of flight can then be watched with awe as every fibre is used to tear through the sky. 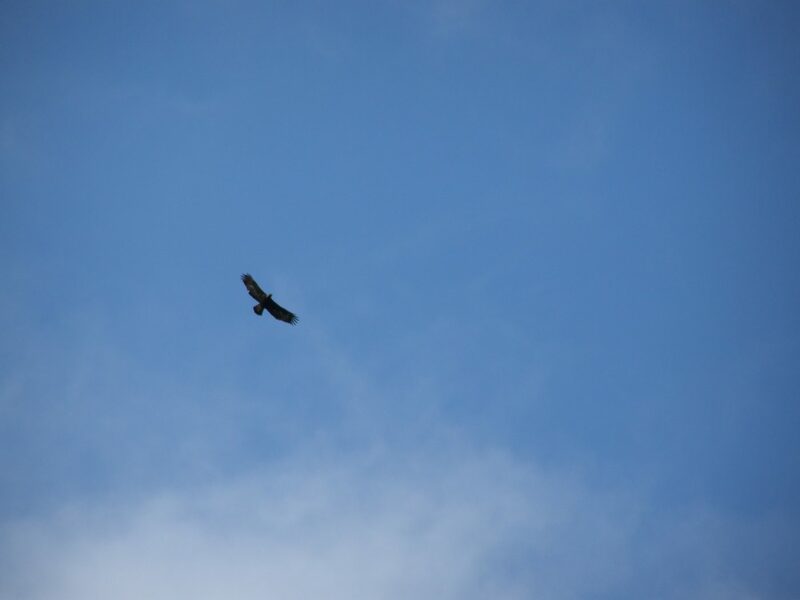 It’s always a special moment on Quinag when I see one soaring overhead. It’s like a privilege to live alongside these creatures. Golden eagles awaken in our imagination a faint desire to be more like them, to be more primal and wild. From an eagle’s viewpoint, all our trappings of modernity and civilisation appear suddenly futile. They have a special quality that is created by living in the harshest of climates and the most remote places. They have a resilience almost mystical in essence. Our thanks to Romany and the John Muir Trust for their permission to publish this article.